Product Details-Ingredients-Corn, poultry meal, rice, soybean meal, chicken oil, full fat soybean, brewer dried yeast, dried whole egg, lecithin, fish oil, iodized salt, vitamins and minerals, antioxidants and food colouring. 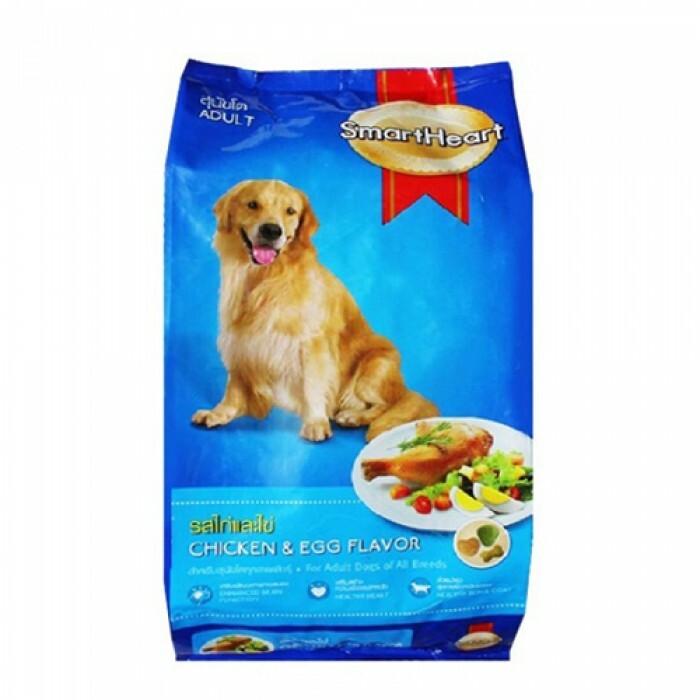 Flavor-Chicken and Egg flavor, Suitable-All Breeds of Adult Dogs,Quantity-3 Kg. Product Information -Smart Heart is meant to meet complete nutritional needs of adult dogs through its high-quality and balanced ingredients. Chicken and egg flavored diet is further enriched with the addition of fish oil (storehouse of DHA and Omega-3 fatty acids) and Lecithin (rich in Choline). DHA and Choline promote the functioning of brain and nervous system. While Omega-3 fatty acids work to boost the health of heart. Balanced amounts of calcium and phosphorus enhance the strength of bones and teeth. Bodys power to thwart foreign organisms gets strengthened with vitamin E and selenium. The highly digestible food would also make the coat shine with health and wellness.